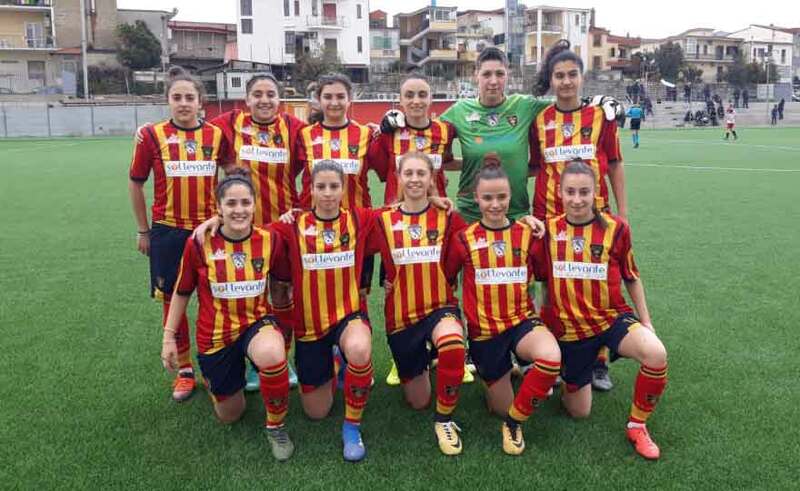 The last away match of the Serie C championship ends with a defeat for the Salento Women Soccer: 4-3 the final result in favor of Vapa Napoli at the end of a daring match. Partenopee ahead for 2-0 in the first half hour, then the comeback of the Salento with two goals from captain D'Amico and the goal of Cazzato, then the expulsion of Guido and with the Giallorossi remained in ten the master of home they take advantage to overturn the score again thanks above all to the negative day of goalkeeper Mariano. "I state that the Vapa did not steal anything, in fact I congratulate our opponents, but we have complicated our lives alone with very serious individual errors - underlines coach Vera Indino -. I refer to three of the four goals conceded and to the episode of expulsion. Too bad, because we could have won a positive result and instead we are here to comment on a defeat. Now let's enjoy the Holy Easter after which we will try to close the championship against Aprilia with a flourish ". The bitterness of defeat is mitigated by the brace of Serena D'Amico who with his 38 goals is now one step away from winning the title of top scorer in the C series. Sunday, in fact, the C series rests, the second round of the C series 28 / 2018 is scheduled for resumption on Sunday 2019 April: Aprilia will be on the scene at the Collepasso municipal, at 15. Results (21st day): Aprilia-Chieti 1-2; Yellow Apulia Trani-Griffon 0-2; New Team-Ludos 0-10; Sant'Egidio-Naples 0-4; Pescara-Potenza 13-0; Vapa Naples-Salento Women Soccer 4-3. Ranking: Napoli Women 58; Yellow-green Griffon 52; Ludos Palermo 49; Salento Women Soccer 41; Sant'Egidio 36; Pescara 31; Chieti 25; Aprilia 23; Vapa Naples 22; Apulia Trani 19; New Team San Marco 7; 0 power. Vapa Naples: Giordano, Apicela, La Manna, De Rosa (24 'st Albano), Ferrara, Russo, Albertini (24' st Miroballo), Galluccio, Iannotta (40 'st Carratù), D'Avino, Napolitano. On the bench: Fiacco, Sorriso, Penniello, Perretta, Luongo. Vittorio Esposito coach. Salento Women Soccer: Mariano (38 'st Errico); Sozzo, Felline, Ouacif, Costadura; Guido, Cucurachi, Coluccia (11 'st Aprile), Cazzato; Bruno (1 'st Carrafa R.), D'Amico. On the bench: Alemanno, Rollo G., Vitti. Vera Indino trainer. Markers: in the pt 14 'D'Avino (V); 28 'Napolitano (V); 36 D'Amico rig. (S); in st 2 'D'Amico (S); 20 'Cazzato (S); 35 'D'Avino (V); 38 'Miroballo (V). Notes: about two hundred spectators. Expelled from the 23 'st Guido (Sws) for a second yellow card. Ammonite: Cucurachi (Sws), De Rosa, Apicela and Napolitano (V). Recovery: pt 2 '; st 5 '.